As we move away from winter into the spring, it's time to focus on the health and wellness of our home: first stop, the roof. Spring brings about a lot of rain and moisture is your home's worst enemy. At StealthBond®, we not only want to provide you with a superior metal roofing system but the tools you need to keep it healthy. Knowing how to prep your roof for the rainy weather will give you an advantage. In climates that experience a lot of rainfall, gutter maintenance will ensure the longevity of your metal roof. When water hits your roof, it needs to go somewhere. Gutters capture water and transfer the runoff down and away from the house and foundation. Unfortunately, there are other things the gutters can collect such as leaves, branches, dirt, etc. There are a few different components to the gutter system like the downspout and extensions that also play a role in moving water away from the house. For optimum performance, we highly recommend keeping these areas clean. Cleaning your gutters is simple DIY metal roofing maintenance. The first thing you want to do is remove debris. Sometimes you have the option of working with them when they are wet; sometimes they are dry. We have solutions for both. When the contents are wet, you can lay down a tarp on the ground below and scoop out what's in the gutter and dump it on the tarp. Because it's wet it will just land directly below. If the contents are dry, get a bucket and cut out the bottom. Grab a plastic trash bag and secure it to the bucket using a rubber band or duct tape. The bucket will act as a funnel directing everything into the garbage bag. You might have to walk up and down the ladder a few times, but you'll thank us when the dry debris doesn't make a bigger mess. Large trees that grow near the home provide shade which is ideal in the summer. It can regulate the temperature and make running your A/C unit more energy efficient. And, let's be honest they make the exterior of your home look gorgeous. What you need to do in the spring is a prune. Pruning trees correctly will help maintain the integrity of the roof and keep the tree itself healthy. 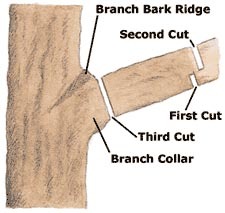 Branches can rub and cause unnecessary abrasion. Broken, weak branches can drop off and get stuck in the gutter. 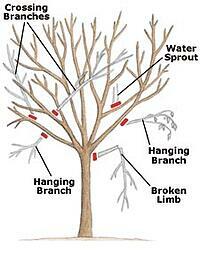 Prune at the beginning of the spring when your trees haven't completely bloomed to be the most effective. This diagram is an excellent guide to help you prune and remove branches while still keeping the front of your home looking amazing! Your roofing contractor considers this when installing your metal roof, so you don't need to worry about that too much. However, what is your responsibility as the homeowner is keeping a watchful eye on the attic. Spring brings a lot of rain, and you really don't want to have a problem with condensation. Check your attic for signs of moisture. Signs would include stains, mold, or mildew. Sometimes it will also smell damp. If you encounter any of these problems, get your roofing contractor in to complete an inspection. While they are there, get your money's worth and ask them to do an energy audit to confirm that you're doing to the best to save money each month. The StealthBond® Installation System is a superior choice when it comes to metal roofing. Over the many years in the industry, you've said that you want the performance of the metal roof without the fastener failure headache. We agreed. That's how we developed this patented system that provides unparalleled performance that makes your home look beautiful. Download our eBook below to learn more about StealthBond® Installation System.